Preserved remains of creatures from the past. They form when an organism dies, is buried, and over long periods of time the organic part decays and is replaced by minerals. 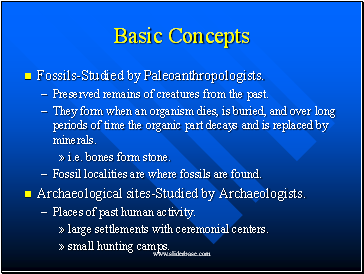 Fossil localities are where fossils are found. Places of past human activity. large settlements with ceremonial centers. 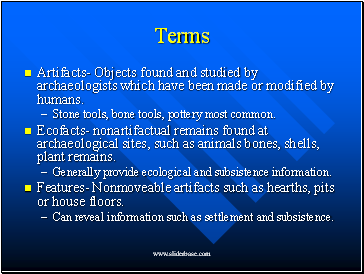 Artifacts- Objects found and studied by archaeologists which have been made or modified by humans. Stone tools, bone tools, pottery most common. 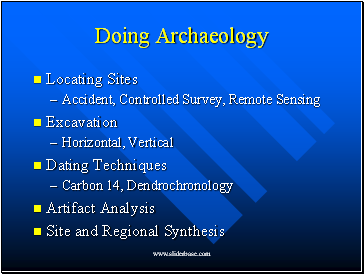 Ecofacts- nonartifactual remains found at archaeological sites, such as animals bones, shells, plant remains. Generally provide ecological and subsistence information. Features- Nonmoveable artifacts such as hearths, pits or house floors. Can reveal information such as settlement and subsistence. 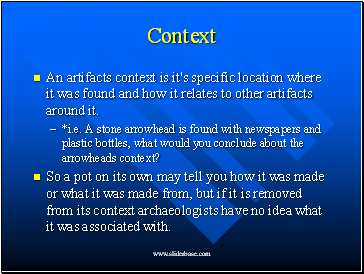 An artifacts context is it's specific location where it was found and how it relates to other artifacts around it. *i.e. A stone arrowhead is found with newspapers and plastic bottles, what would you conclude about the arrowheads context? So a pot on its own may tell you how it was made or what it was made from, but if it is removed from its context archaeologists have no idea what it was associated with. 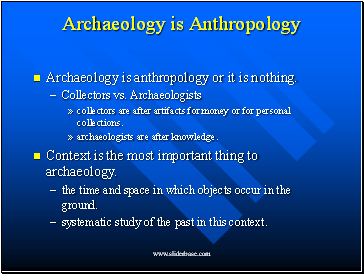 Archaeology is anthropology or it is nothing. 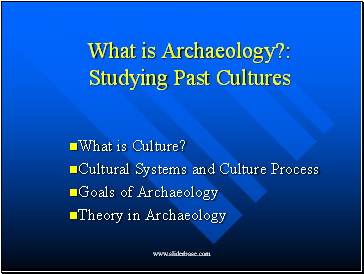 collectors are after artifacts for money or for personal collections. 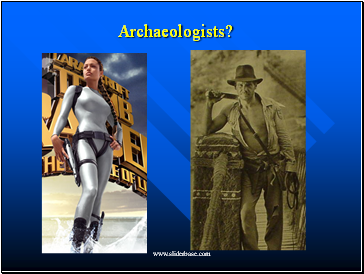 Context is the most important thing to archaeology. the time and space in which objects occur in the ground.